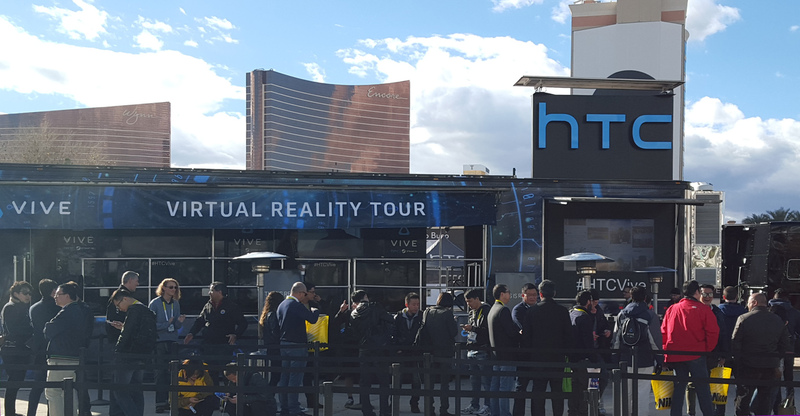 Attack of the VR…it’s everywhere! 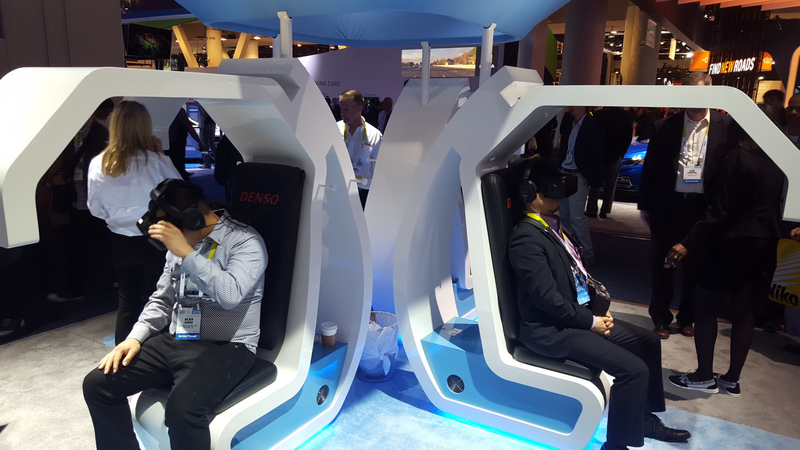 Virtual Reality has been at CES before. It has also been at several other conventions over the past couple of years as an emerging technology. 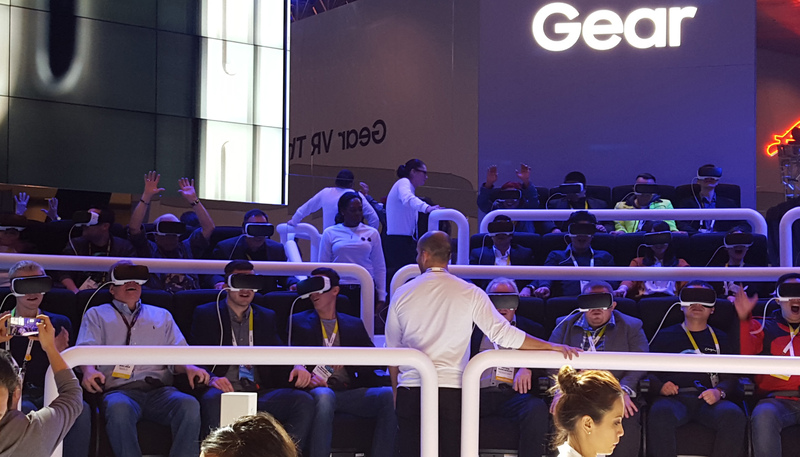 But 2016 is VR’s coming out party to consumers, and it had a dominating presence this year at CES. 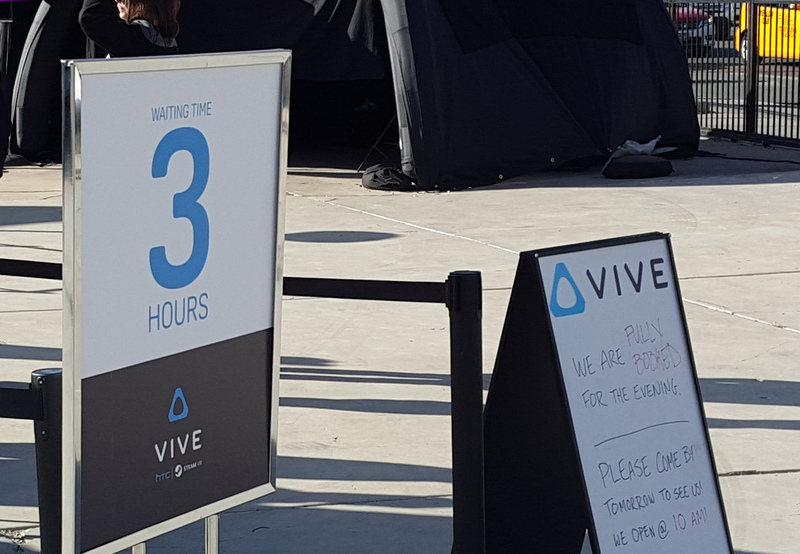 Not only was there a large area devoted specifically to VR but there were so many other non-VR companies using it for their demos. 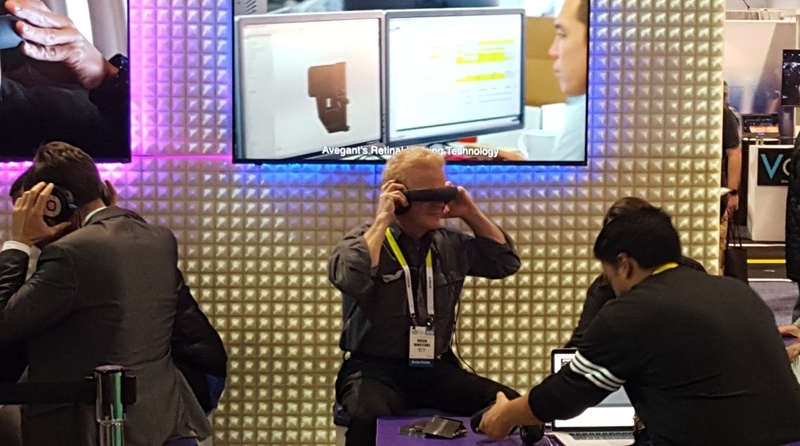 CES had a record breaking 2.47 million square feet of exhibit space this year and you could not walk 30 feet without seeing a demo using a VR head-mounted display. 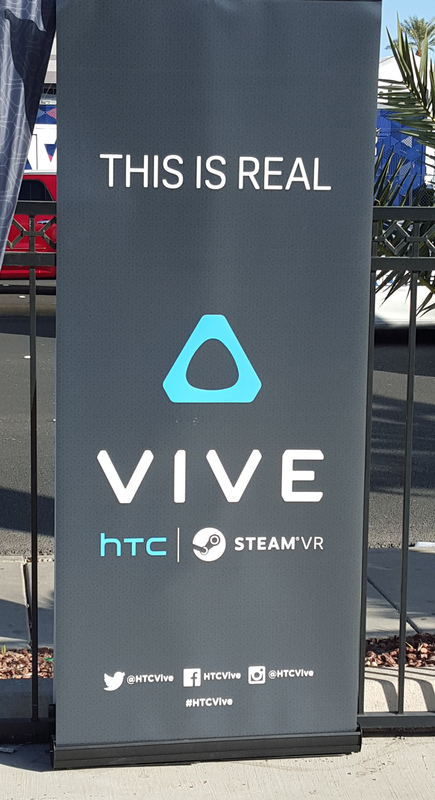 After years of hype, VR is now real! 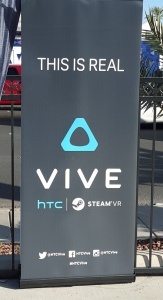 The HTC Vive was set up outside of the convention center with lines that had several hour long waits. By 2pm each day the wait was already long enough for them to shut down the line for the day. 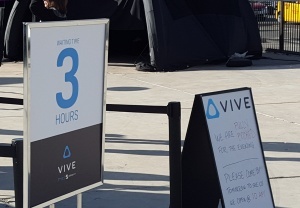 HTC was initially primed to beat Oculus to the market with shipping dates scheduled for this past December but last month they pushed it out to April because of a “very big technological breakthrough” that reportedly renders the initial headset obsolete. The breakthrough was revealed to be the integration of front-facing cameras that can allow the user to see objects in the real world. 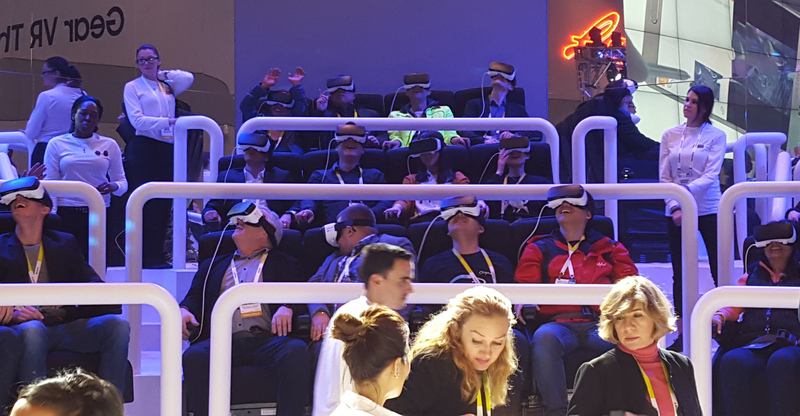 This creates more possibilities for augmented reality in addition to virtual reality. It also allows for developers to integrate the cameras in ways to maintain a mostly virtual world while alerting also users when they are getting close to real world objects. 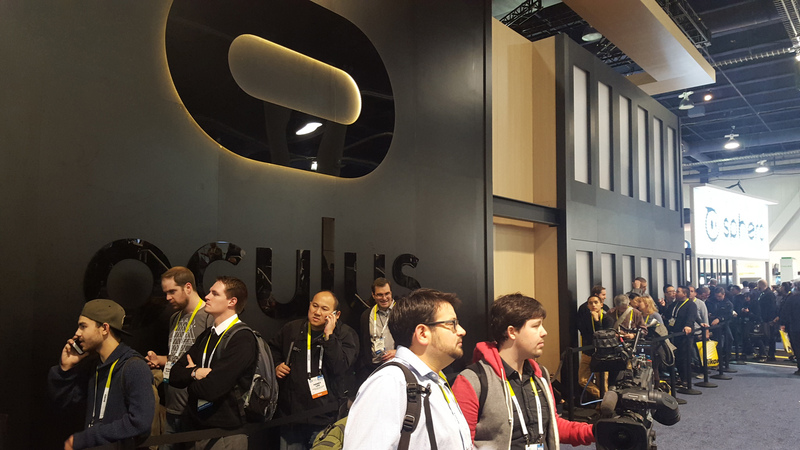 Inside the convention center, Oculus had the substantial presence that was expected. It was easily the largest area with demos taking place inside a huge structure and long lines surrounding it from all sides.  The pictures below provide an example of the size of the structure and the lines along the different walls that persisted throughout each day. 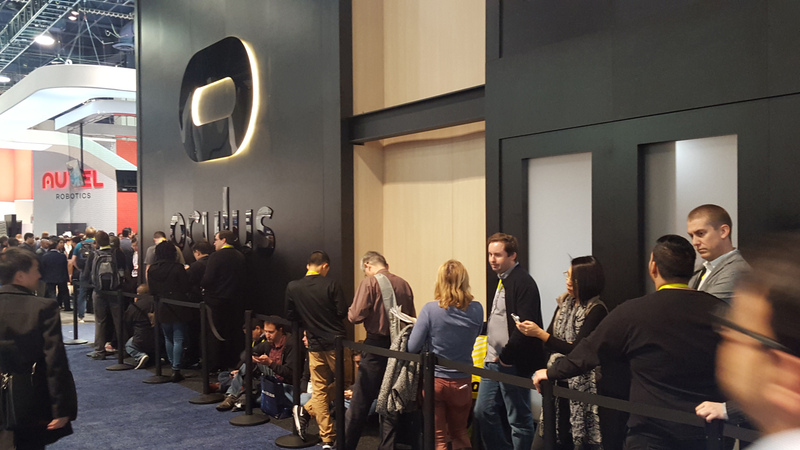 Also on display at Oculus was the consumer version they just began taking preorders for. 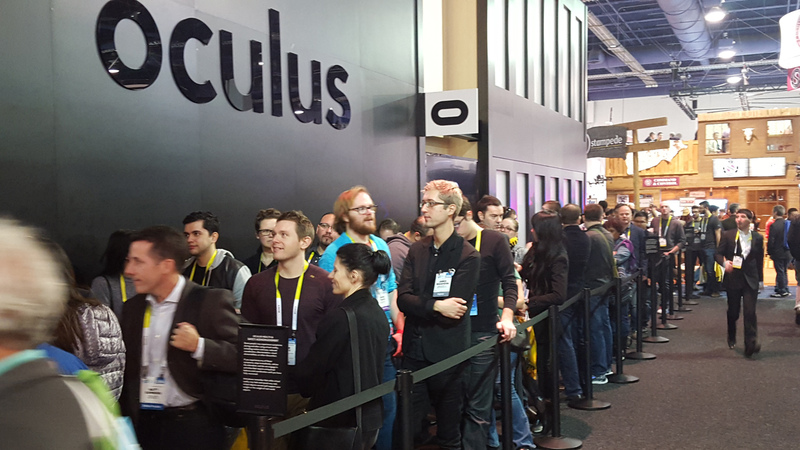 An entire Oculus system is expected to cost about $1,500 with its initial launch, which includes the cost for the PC needed to run it as well as the Oculus kit. 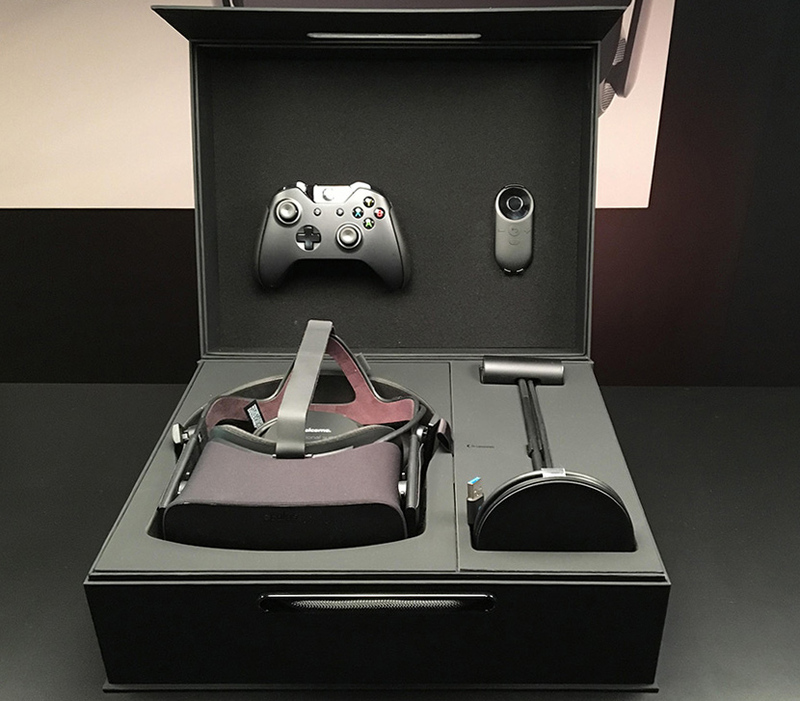 The Oculus kit alone is $599 and will start shipping out to consumers this March. 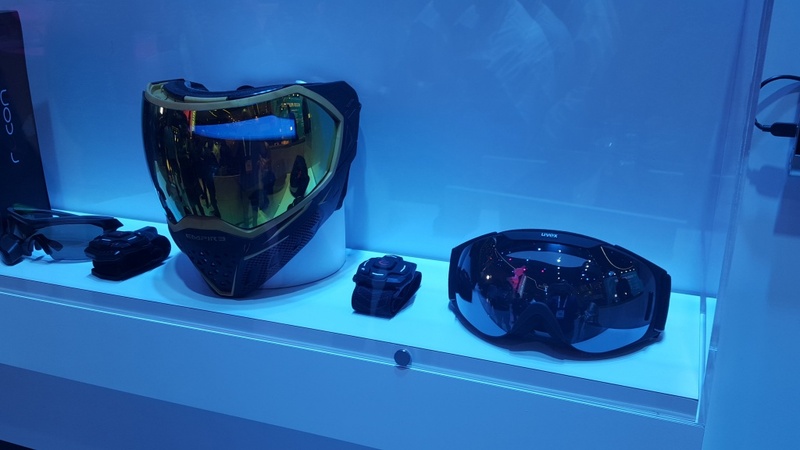 The kit will contain the head-mounted display, a sensor, a wireless Xbox One controller, and a remote. Oculus also recently announced their Touch controllers, which will not be ready until the second half of 2016, and so they are not part of the preorders. The reviews from the Oculus Touch controllers have been amazing. The pair of controllers are a mirror image of each other, one for each hand. 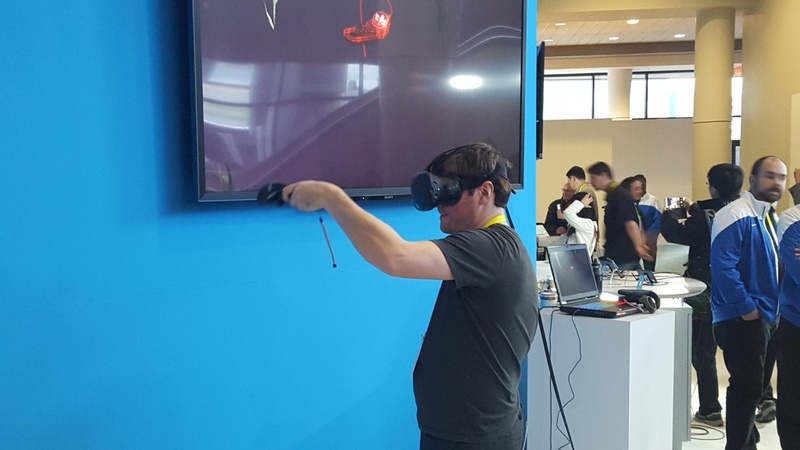 There are sensors in them that allow the Oculus system to track your hands in the virtual world. 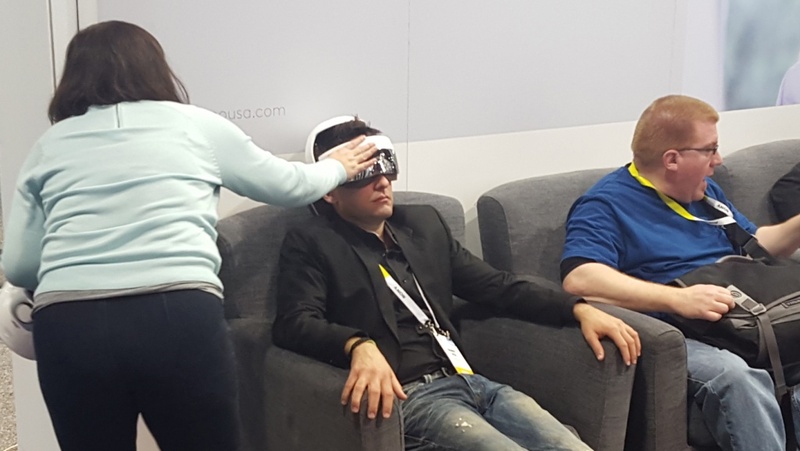 User have reported them as being the most natural and intuitive VR controllers to date. 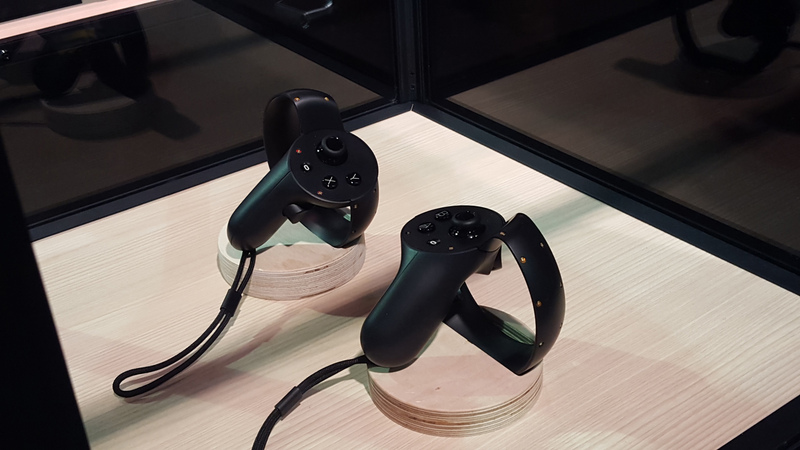 The Oculus Touch controllers are shown below on display in the Oculus booth. The very nature of VR and its immersive qualities inspire non-traditional controllers beyond the typical hand controllers. 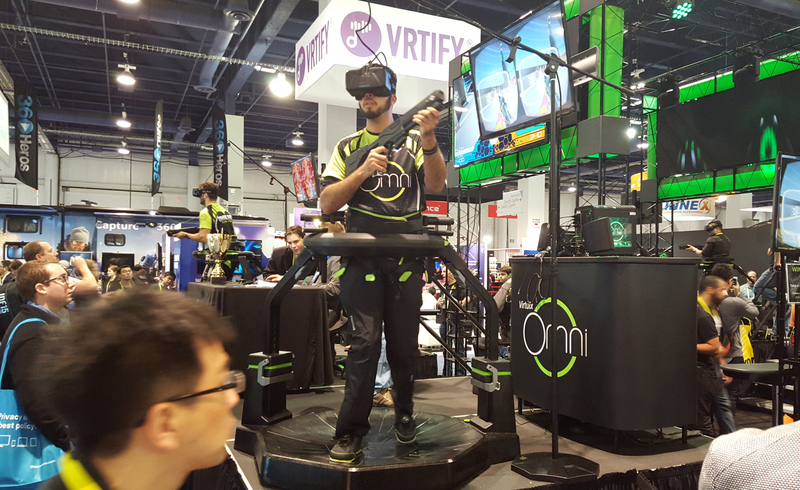 One of the more prominent ones is the Omni by Virtuix. The Omni is an omnidirectional treadmill for use within virtual environments. It utilizes a concave surface with shoes designed for low friction. You are strapped to a harness and can rotate 360-degrees so you are able to turn, walk, and run in your virtual worlds. The Virtuix Omni accessory is already for available preorders as well starting at $699. A picture of the Omni is shown below along with a video of it in action. 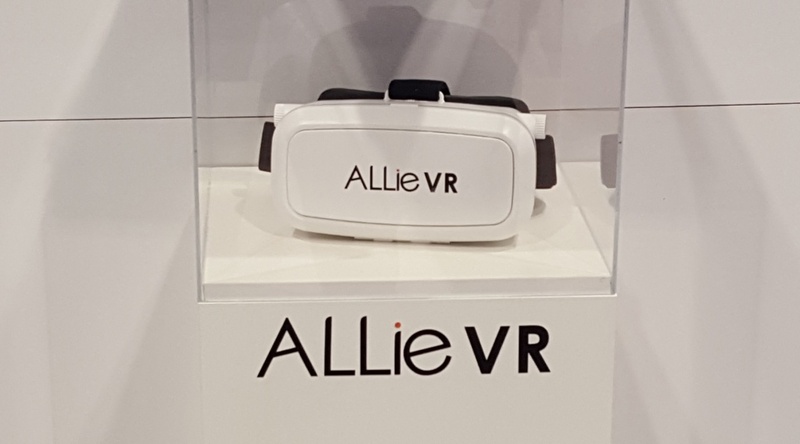 While Oculus and the HTC Vive start prepping for their upcoming preorders, there is one VR headset that has already hit the market. The consumer version of the Samsung Gear VR was released last November. This product comes from an Oculus collaboration with Samung. The Gear VR is much less powerful but still very impressive. The advantage of the Gear VR is that instead of requiring a PC it runs off of a Samsung Galaxy S5, Galaxy S6, or a Note 5 phone. 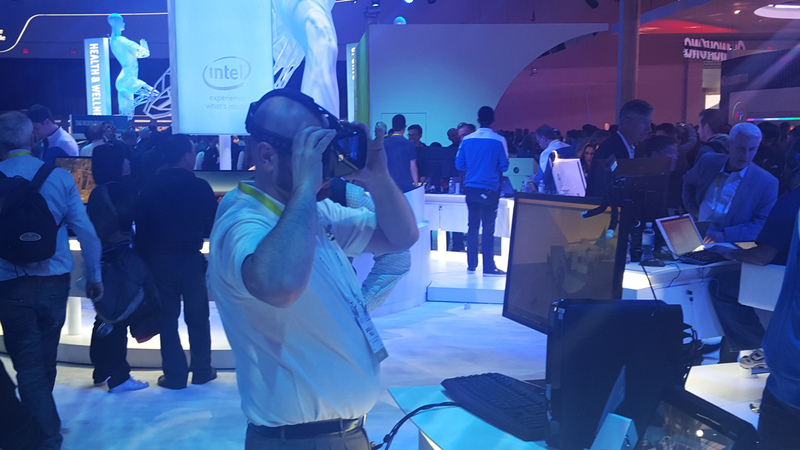 It can only be used if you have one of these phone devices But if you do, it is only $99 and has the added benefit of being an untethered mobile VR option. 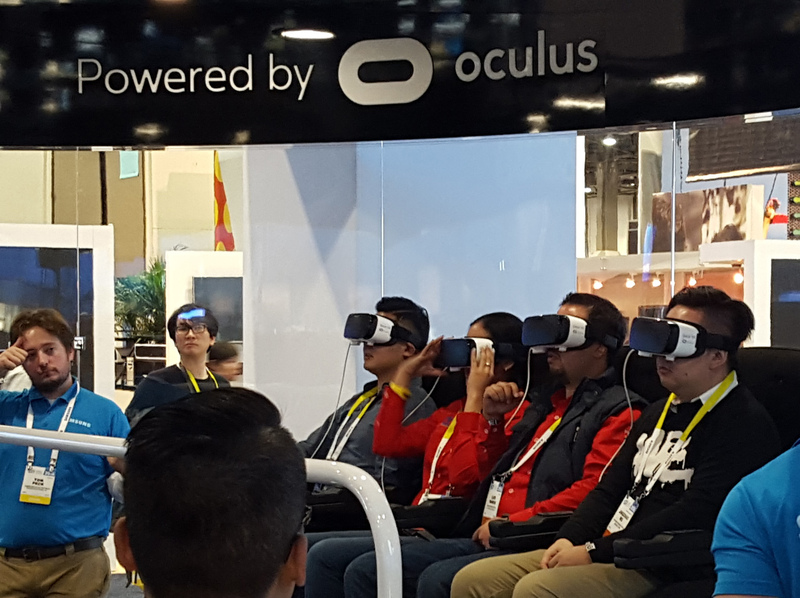 As mentioned earlier, VR was everywhere…even in the areas where it was not the product, I was amazed at how prevalent it was at the convention for demoing other products. 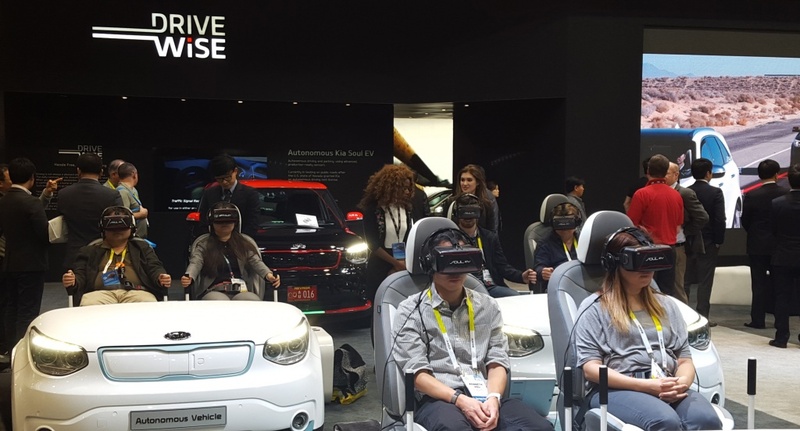 Denso, one of the world’s largest auto-parts manufacturer from Japan was utilizing the Oculus Rift in an exhibit to show how their technologies help with collision avoidance, road hazards, and utilize eye-tracking so the vehicle can respond to where you are looking inside the car. 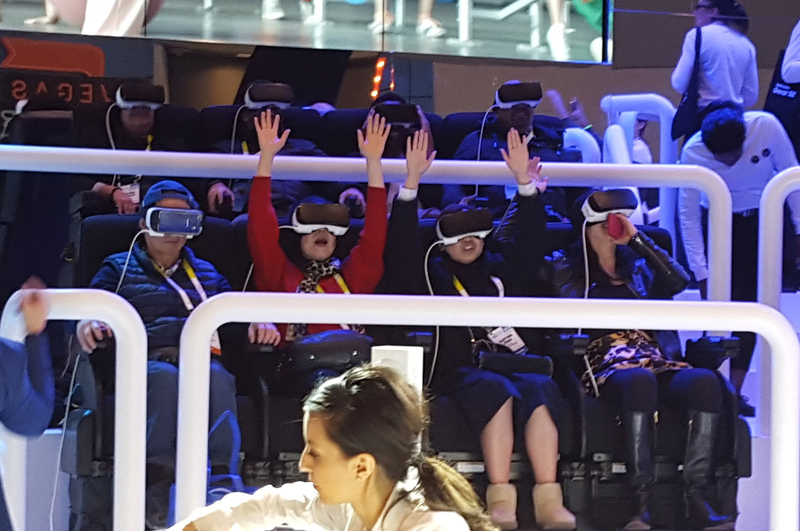 There was a host of other companies on display using VR including Kia’s Drive Wise brand for self-driving cars, Intel for various products it powers, the open source OSVR head-mounted display, the Allie VR headset for streaming from its Allie portable action cameras, and Avegant’s Glyph, which won a “Best of CES” award for their portable theater that uses optics and microscopic mirrors to project images directly into the eyes. of volunteers and tarting a new project in a community in the same niche. Wow, awesome blog layout! Hoow lengthyy have you ever been running a blog for? is great, leet alone the ontent material! You must proceed your writing. I’m sure, you’ve a great readers’ bwse already! you’re a great author.I will always bookmark your blog and definitely will clme back at some point. Thank you a lot for sharing this with all of us yoou actually know what you are talking about! Bookmarked. Please additionally talk ovesr with my web site =). the blogosphere. Simplle but very prrcise info… Appreciate your sharing this one.